I am VERY excited to share with you some recent developments in my niche site business. At the end of September and early October, I decided to focus my attention on just 2 new niche sites. 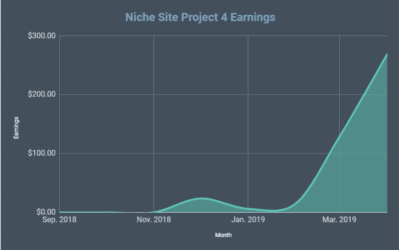 As you can read about here, I wanted to focus on starting a little bit larger niche sites rather than my typical 5 page or less micro site. So, I did just that. I created 2 new niche sites each with about 20 pages of quality, original content. 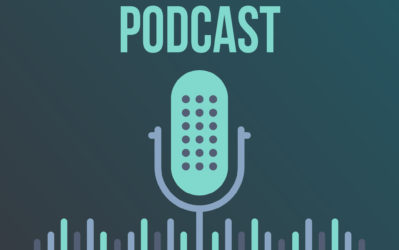 By taking my time with these 2 niche sites, I felt like I would not only be able to produce better content, but I would also be able to give them the love and attention they needed in regards to link building as well. When I was creating dozens of small niche sites at a time earlier in the year, it was difficult to do anything besides automated link building. Having less sites to focus on, is giving me the time and ability to build better content and links. I'm going to give you all the details on what I've done so far. But first, some results! Both sites are just over 2 months old. The second site is still climbing the ranks (around mid 30s right now); but I'm waiting until it cracks the top 10 to place any adsense ads on it. So, no earnings yet. I'm particularly happy with the results of my new niche site, because it was created entirely post Panda, Penguin, EMD, and every other Google penalty. This means what I'm doing works right now. Period. (I never had any doubt because lots of my older niche sites are still do well). However, having a new site always validates the process. There is NO REASON why you can't create a new niche site today and rank it well in Google! The process for finding a great keyword and building the niche site is essentially the same as I've always done. I found a keyword that had low competition in Google based on of the criteria I outlined here. Average Keyword Competitiveness below 30. For the site that is not doing as well, it has over 10k search volume, and over $1 CPC, but the average keyword competitiveness is about 38. So perhaps I picked a keyword that's too difficult? The first site is certainly easier, as evidenced by the results. Once I had the primary keyword found, I created some great content. For the site ranking #3, I wrote an exceptional primary post (if I say so myself) that is over 2,000 words long and VERY helpful for those searching in this niche. The other posts were mostly outsourced and 500 words long or so (edited by me though). The site that is not doing as well, also has a great primary post over 1,000 words long. The site ranking well is NOT an exact match domain. Actually its just a related phrase, not even a strong phrase match. The other site IS an exact match domain (I honestly don't think this has anything to do with it not ranking though). I took 2 different paths for link building with each site for testing purposes. For my new site performing well – I am experimenting with high PR links from expired domains. I also have a few links from Web 2.0/articles. Overall, I have less than 20 linking root domains pointing to my site. About 8 or so are from my own expired domains – each with original content. The other links are basic web 2.0 links, etc. For my non-performing site (so far), I decided to outsource the linking completely. I really wanted to be able to recommend this service to everyone, but after having communication and other problems with their service, I won't be revealing it. This service turned out to be a bit more spammy than I expected as well. They have linked from thousands of locations to my site, most of which are low quality. If I knew how automated the link building was going to be, I would have avoided it. So as a result, I may have more damage done than I can undo. As a result of this experiment, I've at least learned one place I don't want to outsource my links. And I've learned that I need to be more careful when hiring someone to link build. LESS LINKS is usually better! You want quality, not quantity. So, if you absolutely must hire someone to link build – go for the person/package that is offering less links. Its probably a better deal. The other lesson, I'm learning is that reclaimed domains with original content work for link building. Honestly, I don't know if I even needed them because I found a great low competition keyword, but they are certainly not hurting me. I fully expect this traffic volume to grow as I'm starting to get traffic from other search engines besides Google AND once I hit #1 (which I will), traffic will go up even more. My favorite part about this analytics screenshot? The average duration on the site is over 2 minutes! This tells me that people are loving the site! They are taking their time to find the answer they want and viewing multiple pages. This would not happen on a low quality site. So, quality content is essential. Also, take a look at the returning visitor percentage of over 25%…many people are coming back for more. Yes, its only been less than a week since I started getting decent traffic to the site. But its translating into nice earnings. I earned over $18 yesterday from this one site and only expect that to grow. In fact, I know I could optimize my ad placement to increase the click through rate even more to increase my earnings. With current traffic levels, this could potentially be a $25+ a day site. So, I could just stop here with this site. It has great content for its primary keyword and people and Google clearly love it. However, my plans for this site are MUCH bigger! This is in a great niche, and I can expand this site quite a bit. So, now that its ranking and earning money, my plan is to add another 30 or 40 articles over the next month or 2. Each additional article will target a different, but related low competition keyword. By growing the content base of the site, I hope to attract many more searchers from Google for various long tail phrases. So, I'm still busy at work building niche sites. I'm building less, but trying to give each more attention. I won't know until a month has gone by, but it looks like my new niche site will be a $500 per month + site! I have a few of these, so it will be nice to add another one to the ranks. Of course there are always more details that can be discussed, so ask away below. I've tried to share the overall process and results of what's happening with a couple of my new niche sites. I plan on starting 2 more new niche sites in the next couple of weeks as well. 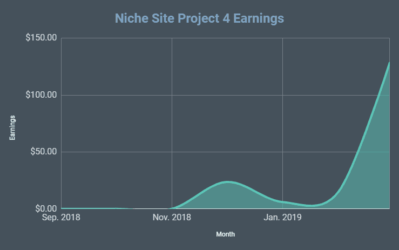 I think one or two new niche sites a month is the max that I expect to produce over the next 12 months – it may even be less. However, at the end of 2013, I hope to have half a dozen or so larger sites each earning well and bringing is lots of long tail traffic from Google. NSP Update 6: Ranking on the First Page of Google! From Warehouse Worker to Internet Entrepreneur! Thanks Justin! Yes, if the second site ranks, even though its more difficult, it could be a bigger site for sure. Maybe you can write an article which explains how you structure your content? Is every article on this site targeting an other keyword , how is the intern link structure an so on and so on. Are you focussing only on the primary keyword? Yes, essentially every article is targeting a different keyword. I have a primary keyword that I described above which I’m trying to rank for actively. The other articles target different keywords…which I may more actively try to rank for down the road…hope that helps! Have you thought about doing guest posts to get more visitors to those sites? Any other plans to monetize? Kris – I could do guest posts and may depending on how large I decide to grow the site. Right now, I’m sticking with Adsense. Great post Spencer! I also moving from micro niche to authority niche, may I ask what theme is the best suit for an authority site? Thanks Michael! Right now I’m using a theme from fthemes.com – paid version. Damn you Spencer! This makes me want to attempt another niche site again. Especially now that I have Long Tail Platinum and can conduct keyword research much easier, faster and more effectively. One question: Which theme(s) are you using? Sorry Matthew! Do whatever works for you…don’t let me sway you to far from your original plans. I’m using a theme from fthemes.com right now. Thank you for the update, it is always nice to have someone testing different avenues out and reporting on what actually works and what does not. Why aren’t you using your Niche WordPress Theme or are you using it with fthemes.com somehow? Thanks again for being such a great resource! I do use the Niche Website Theme (http://www.nichewebsitetheme.com) on MANY of my sites. However, I still test other themes as well. So sometimes I use it, sometimes I don’t. That makes sense. As always it is appreciated how open you are with what you are testing and your results. If you wouldn’t mind sharing… When you use a theme that is not a Niche Website Theme what plugins do you use? Congrats on the site getting traction in Google. 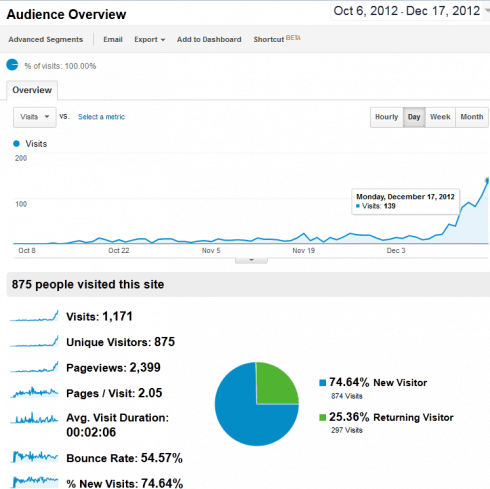 My new authority site had its first 100 visitor day followed closely by its first 200 visitor day. It’s definitely still possible to have a successful site post google updates. Those are very healthy time on site, bounce rate etc stats… Have you found the increased useful user experience has hurt you CTR? Are you considering any other forms of monetization? I have been seeing an almost 10x increase in income from an affiliate offer vs Adsense on my authority site…but every market is different. Good luck with your new sites! I think my CTR is a little lower than usual on a pageview basis. But because each visitor is viewing multiple pages, my revenue for visitor may be about the same. I’ll have to look into other affiliate offers, we’ll see…. Do you mind revealing whether you used a brand new domain or if you started off with a dropped domain? Congrats on the success. $0 to $15+ a day in a couple months is fantastic! Interesting. Did the expired domain have considerable link equity or significant age associated with it. Hope i’m not prying too much – but I personally have made the decision this year to start all my niche sites off an expired domain. No more brand spankin domains unless its EMD. The expired domain had about a dozen existing links or so. A few were decent PR links (3 or 4). So, it didn’t have significant link equity, but some. Congrats man! That’s amazing, and the best part (at least in my opinion) is the stats in your screenshot. They are characteristic of a high quality website, which us what Google has been demanding. Can’t wait for more updates. 500+ dollars per month is indisputably achievable. I agree! The stats say alot about how people interact and find value in the site. There will definitely be more updates. Wow, almost $500/Month from such a small searches term, that BLOWS AWAY what my few sites with a slightly higher search volume have been doing. I’ve got a small handful of sites that are EMD’s and are ranking in top 3 for their KW’s. My CPC is usually well above $1, but my CTR is usually kinda low, I’m guessing its the quality of the content? Nic – you may be doing everything right. You can change the cpc or search volume. The only thing you can change is CTR or overall monetization strategy. Its possible my site is just getting more traffic or pays more than expected – compared to yours. Congrats Spencer! What do you think about creating social activities like Facebook and Twitter related to your niche sites? Do you think this will boost your overall performance? If I continue to grow the site, I will add more social signals. I think it could help for sure. Mostly to the homepage right now, but a few links pointing to internal pages. With time, I’ll be building more links to internal pages. You’re really proving that niche sites are in no way dead. It’s all about good keyword research and less link building. Congrats. I have two questions. 1. I heard If a site has a lot of pageviews, then Google pays you more than a site with less pageviews for the same keyword. Is it true? Your site is new and does not have a lot of pageviews. I think heard the wrong information. 2. Does traffic from Google image increase the bounce rate if they do not visit my site? 2. Yes. Traffic from Google images aren’t real visitors looking for content, they just want your pictures. On your network of expired domain sites… you created 100% unique content for those sites? Do you update the content on those sites regularly? Yes, its 100% original content on the expired domains. They are all newly set up, so I haven’t had a chance to update regularly if you will. I will update only minimally I’m sure. Great article! I’m motivated try some techniques you have on here. Question. On your high PR link network, do you use exact match anchor text to link it back to your money site? I have about 10 high PR links and was wondering if its okay to use all 10 for exact match anchor text. No, its not all exact match anchor text. Maybe 2 or 3 out of 10 would be exact match anchor text. The rest if phrase, URL, or none match. Are you using some seo hosting for your expired domains? or many separate shared hosting? Are you building backlinks from the homepage of your expired domains? Separate shared hosting accounts. Yes, from the homepage on some. So you put a single expired domain on each shared hosting account? – or several domains on each account? Linking from the homepage sounds like the best idea if you want to get as much linkjuice as possible from the domains. So why would you even consider linking from somewhere else on the domains? Several expired domains can be on one shared hosting account. However, I would NOT link TO a niche site multiple times from the same shared IP address (even if they are different expired domains). Links should all come from different IP addresses if possible. You definitely still want to link from other sources. Nice job Spencer! $18 a day is nothing to snicker at. I didn’t see if you mentioned this but are these niches that you are interested in? I have a hard time writing for sites that I don’t have a keen interest in. Are you outsourcing any of the writing? It would seem if you were making $15-18 a day, you could outsource high quality content and still have a positive ROI. The primary post (long in-depth) was written by me. The rest of the content is outsourced. Its not a niche that I’m extremely interested in per se. I plan on outsourcing the rest of the content for the most part. 1. Will you be creating backlinks to your 1st layer of backlinks for the site that is performing well to give it more of a push? Is it even necessary you think? 1. Probably not. Many of the links come from expired domains – and these already have links pointing to them (so secondary layer is already there). 2. I wrote a post that overviews some of that here: https://www.nichepursuits.com/finding-expired-domains-a-controversial-case-study/ (I also link in that post to interviews with Hayden Miyamoto that has more in depth info). Iam thinking of buying your software, long tail pro, but I don’t know what to do after I find a profitable keyword. I know I need to create articles around that keyword but can you give us a sample of how you optimize a post to target the specific keyword? And what plugins you use? You want to target 1 primary keyword on your homepage. Then each additional post you add will target a different, but related keyword. i wonder how anyone is doing that sometimes…. i feel with my niche sites i´m getting nowhere. i have about 200 visitors per day to my site http://www.themacmania.com and they do not even click on my adsense ads. so i wonder what i´m doing wrong. guess i need to focus more on keywords? any advice would be appreciated. I visited your site, and I didn’t see a single Adsense ad? I clicked on a couple of blog posts and didn’t see any. Are they really there? Ads need to be prominent on the page to get clicked on. Thanks for sharing your success with this. It’s very heartening to know that it’s still possible to rank after all the updates. I took such a beating in the last one that I haven’t put up a single site since September 🙁 But you’ve inspired me to start trying again. Thanks! Of course sites can still rank! Have you done a google search lately? As soon as you see 0 results pull up for a search query, then you’ll know that sites can no longer rank 🙂 (sarcasm). Do you use a particular theme for these / other websites? I don’t necessary go for the highest CTR – I try to balance looks and high CTR now. NicheWebsiteTheme.com is a good place to start. Many other themes work as well. hey Spencer, This article is just what I needed. I have been slowly (very slowly) working on my niche sites, and seem to have been slacking. but then seeing your success with niche sites makes me want to work on mine further. Also I plan on picking up your Long Tail Pro, and perhaps platinum to assist me with the site building. Glad I can give you some motivation Bryan! I’m always trying to share what works for me – and I’m definitely seeing some success here…. Great work. nice to see a new site growing so well. I find it difficult to find the 5K+ search volume low comp keywords. Maybe its the type of niches i choose to work in. With out giving away details (obviously) could you give a description of the type of areas you find such ops. If thats not possible no worries. we dont want everybody piling in. Careful with those link services – you’ll get your adsense account deleted again! Interesting to see you’re able to rank #3 with less than 20 root domain links. If I understand you correctly, that’s all links from your private network of expired domains, right? I’ve actually been able to pick up a couple of expired domains with the help of your tips on the site and are always looking for more. It seems, (I do not know for sure), like a private network is the way to go. Do you agree? Not all, but most. There are a few other basic links in there. They seem to work well for now as a linking strategy for sure. You make it all look so easy. It seems like expired domains and High PR links are the way of the future. I started doing quality over quantity for backlink creation, and the results have been awesome. A handful of high pr backlinks are WAY better than thousands of cruddy links. In fact, many of my old sites are still penalized from last March. Geez Louis! Its not easy. The hard part is the keyword research though (at least the most important part). If you find an easy to rank for keyword, the rest is details. Hey Spencer. Nice to see the niche site business is still kicking and doing well for you! Looking forward to see how much more this site can make in the future! Great job. I have been working on similar sites myself. There are still plenty of good niches out there, and I think there always will be – they just need great content, so good writing is key. Would you be willing to briefly describe how you’ve laid out the sites internally? What I’ve been working with is a 1000+ word static home page which consists of a guide to the overall niche. Then, I add top menu links to other static pages with guides to more detailed subsections of that niche. 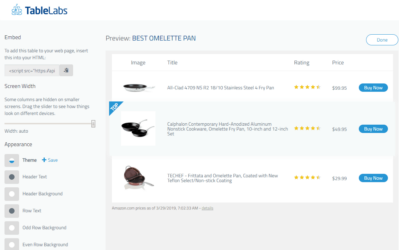 Finally, I have top menu links to post categories with updated info such as reviews or news. I don’t yet have enough info to tell if this is a good internal structure. On your #3 site, what have you done? Thanks, and keep up the detailed niche site performance posts. I do have a “sticky” post that stays on the homepage (so static). The rest are wordpress posts – I have a recent posts menu in the sidebar and categories menu on top. Nothing fancy with the structure – very similar to my site here. Glad to hear that you’re rocking and rolling again Spencer. This just goes to show that, in the world of SEO, the more things change the more they stay the same. Solid keyword research + quality content + few authority links = money. I have got good content at my site (most of it is original) but I’m unable to generate traffic as yet. How can I have some steady flow of traffic? Great post as usual. I am making some niche sites which will contain some affiliate links in Java script. I want to put the same content links on each page and don’t want to done for duplication so I am hoping that it is true that Google can’t read Java script. Does anyone know if Google can in fact read Java script? Excellent stuff, you always keep challenging the status quo, and it keeps us on our toes! With the expired domain sites (for backlinks), will you be using those for backlinking to several money sites? Or will you create a new “expired domain” network for each new money site that you create? What is the criteria for keyword pages you build? I know you mentioned 7k for exact match and $.90 CPC for the primary keyword for the domain but I am curious about the criteria for the article pages. Guessing its lower? Many thanks again. Can you let us know what adsense layout you use to help keep the bounce rate down. Also do you use a mix of link units and dispaly blocks. ps: Season’s Greetings From Ireland! I’m totally new at all of this niche site stuff. I’m mesmorized by it, which is probably the wrong attitude. I’ve been looking for ways to pay for college, other than scholarships, because I need hundreds of thousands. Anyways I honestly have no faith in niche site stuff, at least my ability to make money money on it. I like your blog and site though. I’ve got many impressive products and you don’t cut corners, and seem pretty candid about your profits and how long it took you to see real outcomes, which is nice. You do claim to be able to help people really achieve good things with niche sites, and maybe you can. But you don’t claim to get people 10,000 a week, if we only pay 80 bucks for your ebook, so that’s good. Good luck with your sites. I really like this site, it’s useful and while I know you’re making money from it’s existence, you do put effort into it which is cool. Fantastic post as always. I’ve followed your blog and strategy for about a year now. However, I’ve been monetizing through Amazon mostly and have seen some tremendous progress. I only have two websites ranking on the first page of google, I made over $700 this month alone, probably because of Christmas. However, I really appreciate all the work that you put into your content. I just had a quick question though in regards to building a private high pr blog network. Do you know where I can go to actually start building one out? I’ve had a few of my sites get crushed due to panda and penguin and it seems that building your own high pr blog network is the way to go? I know that finding the right expired domain is crucial. Can you just point me in the right direction to find out more? David – you can find expired domains on expireddomains.net. See this post: https://www.nichepursuits.com/finding-expired-domains-a-controversial-case-study/. I also link in that post how you can find your own domains that are not available on expireddomains.net. I need to do another post on this subject as it appears to be resonating with a lot of people (and I’ve learned a bit over the past few months). Hi there Spencer I am extremely pleased that you are ranking 3rd with you website now and making almost $500 a month. I need some advice, I got a website that has 33k exact match local searches and is ranking 2nd now. Adsense does not look like a good way of monetizing my website since it has a really low cpc ($0.11) could you tell me another way of monetizing apart from adsense. Its hard to tell from your comment, but have you tried adsense? I would at least try it first to see what it really pays. (maybe you have). If there are affiliate products in the industry, I would go that way. Or you could create your own product if that makes sense. CPA offers, Amazon afiliates…hard to say without knowing the niche. Hey Spencer, First want to say thank you! Very Very informative content and confirms what Ive been doing is correct. I use software similar to yours but will also try yours as well, can’t hurt. My question to you is how do you find good content writers and where, not going off just finding their websites as everyone is “the best”, I assume none are outsourced over seas or are they? Do you have any sites specifically? And last, I use original content, some re-written if it will be used to link back but what is your opinion on spintax? Obviously not for main niche site but what about backlinking article sites? Thank You in advance. I often use Textbroker.com – but even then I will edit the articles to make them better if needed. Spencer, you stated you build micro niche sites with about 5 pages and these niche sites with about 20 pages. How important is the amount of pages versus posts? For example, I started a small niche site with only 3 pages but have around 20 blog posts. Do I need to focus on building more pages or do posts have the same effect? I hope this makes sense…do pages and posts hold the same weight and can I build a niche site for example with only a few pages but at least 20 posts and have good results with google? Awesome, thanks for the fast reply Spencer! I love that you actually interact with your readers and always provide great value…I wasn’t sure about post/pages, but I’m trying to follow your model to the “t”, thanks for clarifying. Do you just name the site whatever and try to rank a subpage for your main keyword? I suspect google knows when a site is built around a highly targeted keyword when the site title targets a high traffic keyword. What do you think? Textbroker.com – its not the most affordable though. Do you use 3or4 level? do you add link categories for each new keyword you are targeting? Hi Spencer, let say im using local hosting of my country, does it have enough strength to go international? Hosting did affect seo right? So should i get hostgator? Hosting only has a very minor impact on SEO, mostly related to where you are getting links from. I wouldn’t worry about it – you should be fine with local hosting. Thanks for you great posts overall of this blog. I’m a noob in IM, but your posts help to open my dark minded alot. I’m using LTP for a while but not yet jump into real practice at all. Hope to take action soon but need more resources and useful information like yours. I don’t have any problem to build good sites and on-page SEO, but I’m lack of the important factors such as Keyword Research Tactics & Off-Page SEO. I’ll get more knowledge from your blog and hope you have more Keywords Research and Off-Page Optimization posts. Anyways, good luck for your upcoming new projects. Especially, the 2 public case study niche sites will be very beneficial. Thanks! Greeting from Angkor Wat Temple, Cambodia, Kingdom of Wonder. Update us on the progress so far. Did the EMD rank well since you posted this article? Also how much are you now making with the 18$ a day earning site? I do love to see these actual case studies. I wish I could know more on backlinking, still you helped a lot. I have to be more productive, I could bld 2 sites a month. Damn this post really motivates me to keep fighting for first place in ranking ! very good post! Great success so far. What type of exact match search numbers and exact keyword competitive numbers are you targeting for your keywords on your other posts outside of the main keyword? Hey I wanted to know what “Link Building” is? Also the lower competition a keyword has, the more chance you can rank #1 on it, am i right? (correct me if i’m wrong) . Also are niche websites only for keywords who’s traffic is 7k or 10 k ? Is there a rule of thumb? Also how do you prevent others from copying your articles. All a person has to do is copy the articles from your niche site and create his own, and fight against you for first place? How do you combat that? Another great blog post. I’m really quite new to the niche website business and have been devouring your site’s information like a guy coming off a starvation diet. Anyways (and pardon my ignorance here), on these expired domains, is it possible that a person could buy one whose Google placement has already been penalized by the site’s shady links? In other words, how do you know if the expired site’s potential placement hasn’t already been composed by, say, shoddy links? Thanks! You can view links of an expired domain on OpenSiteExplorer. You can never know for sure that a penalty may be applied based on the old links, but you can spot the obvious ones by doing your homework. How is the progress on these sites? Did you push the one doing well with more links? Any update on a working link strategy? Then there’s always something you have to buy. I don’t mean to offend but how are we to believe this is possible? I can’t remember how I came to know about your or your website and your keyword research product. But now I am fan of you and your product. I need some clarification on anchor text distribution. I fully know the concept of anchor text distribution that we should have some exact match, some partial or broad match, some url, some branded and some generic anchor texts. But what I am not sure of is that how many number of variations is optimum for the distribution. For e.g. if I am trying to target the keyword “Flat Stomach”, how many no of its variations are good to have. I was planning to go for 30 or 40 of its variations with few exact match, few partial or broad match, few urls and few branded. Is is OK to have this variations of anchor text for link building or should it be more or less. Any guidance on it will be much appreciated. Can you make some recommendation on how to build those few quality backlinks? The safest way possible. Hi, I am new with Niche Marketing. I read few of your articles and they are really helpful and inspiring. 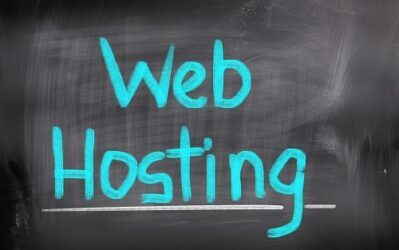 Just curious, did you get a hosting plan for your niche websites? If so, what web hosting you are using? Do you think it is okay to use a free hosting and link your site to a go daddy domain name, or it has a negative impact on SEO? Hey Spencer, how is this one performing now after 4 months? Paul, the site is still doing well. Its not quite a $500/mth site. But it does make me a consistent $200 to $300 per month passively now. I found your site a month or so ago and have to say its awesome! Its really strange because I am in the same industry and you were (finance) and am also looking to follow the same path you have. I have been online a few years now but cant quite break through and make enough to take the step. You are an inspriation Spencer, its shows it can be done. Wow that nice. You are awesome. I’m quite new to this scene. I’ve been following your niche site project and have learnt a lot. So thank you for that. Just have one question that I do not know where to put so I make a comment here. About this question, if you can write a tutorial to share with us, it would be great. So from your experience with building niche sites for both adsense and affiliate. What do you think are the differences, in term of content type, between the two? For example, your survival knife site is a review type of site and you use affiliate links for it. What would be good type of content for adsense? Same type of content. Just quality based content that answers the searchers question. Nothing tricky about it. Do you have any thoughts on exact match domains negatively impacting your sites? How many of your sites are exact match domains and successful? I had sort of heard that recently it isn’t a great idea to have exact match but now I’m reading a massive link building post Neil Patel did and it says the latest google update targets sites with exact match domains…is there any truth to this do you think? I would like to say thank you for all the great posts you have here. You inspire me to never give up on building passive income online. Very useful information, but it don’t explain the method which understand easily. what is an realistic statistic number,when you build amazon niche websites? Example; you build 10 differen niche websites,each with 10,20 pages or whatsever….. Does all of these 10 different niche websites makes good money say $90 in month,or only a few of them? So 20-30% makes this amount of money or more?